July 1st...was Canada Day..and yes, I should have posted about that, but we were kind of busy. 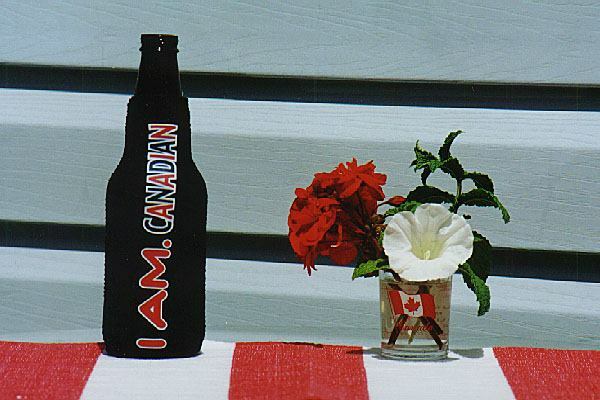 However...it is never too late to say...Happy Canada Day...and, in true Canadian fashion..sorry for the delay. Now then....why we were busy....back in May, while driving the moving truck down, stopped in a cafe in Lac La Hache for brunch. A guy working the place...Victor...a visitor from France...nice dude so we said...Victor, you ever in Okanagan, come and stay. So...he has been with us for four days. Ahh yes...the fan...is now installed and working like a hot damn. There are a few of these trees around and we thought...noo..SHARON thought she wanted one. Turns out the Tamarisk is non-native to this area, is a pig for water and the imbalance it creates in soil, kills most everything else around it. SO..no...we won't be having any of that. Cherries however...they are a good thing! I was at a small community Farmers Market during the week...yes, with Victor...and one of my neighbors was there selling her herbs. Selling woolen goods in 34c heat...naw...I don't think so. And yes....floating the Penticton channel....the summer long past time for thousands.